A controversial 60-acre tennis facility planned at Big Creek Park in Roswell has been called off after the city’s cycling community and residents who use the passive park for recreation raised their voices in protest. The Roswell City Council was set to meet about the tennis complex Monday evening, and residents were planning to show up in red shirts to voice their concerns. The item was pulled from the city council’s agenda just before 6 p.m. Sunday. 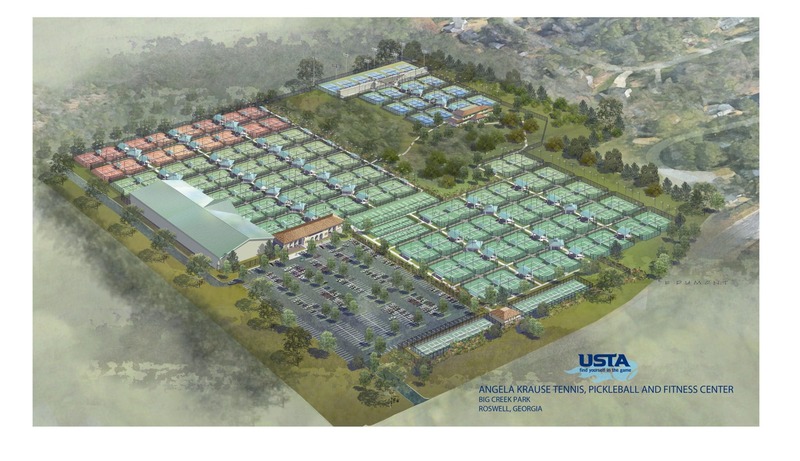 The proposed 135-court Angela Krause Tennis, Pickleball and Fitness Center would have replaced the park’s existing trails and bike paths, drawing the ire of some residents. In a letter sent to residents after the decision to nix the project, Roswell Mayor Lori Henry said the city has heard the protests from residents and will not be moving forward with the project. Below is the full text of Henry’s letter. Good evening. After speaking with Vernon Krause of the Krause Foundation this afternoon, we have jointly decided not to move forward with the Memorandum of Understanding between the City of Roswell and the Krause Foundation to locate the Angela Krause Tennis, Pickleball and Fitness Center in Big Creek Park. The item will be taken off the Monday, August 13, 2018 Mayor and Council agenda. When Mr. Krause approached the Mayor’s office with the generous offer of investing upwards of $50 million in a world-class tennis facility for the east side of Roswell, we were very excited about the project. We believed it would have been an economic catalyst for the east side, drawing other investment into that area and being a driver for redevelopment along the Holcomb Bridge Road corridor east of GA-400. We thought the tennis center would have given the east side of Roswell a destination that would draw people from all over the region. We heard a clear message last year from east side residents during the Economic Development Forums that creating a destination place for the east side was a priority and key desire. However, the community has let us know over the past several days that they do not support this project for Big Creek Park. We want you to know we hear you again, so we will not be moving forward with it. In the coming months, we will hold a town hall meeting for further input from residents on the possibility and location of a tennis center in Roswell. I want to thank Mr. Krause and the Krause Foundation for wanting to invest millions of dollars into our community to honor his daughter. I hope our community will be able to assist him in the future with his dream to build a facility in memory of Angela.